Last week I finally made the time to watch Inside Job, the Academy Award winning 2010 documentary about the recent financial crisis. The film does an effective job of clearly explaining the complex series of factors that led up to the crisis, including a headlong rush into deregulation of the financial services industry as well as the creation of ever more complex and risky financial tools. The root of the problem, though, was the revolving door between government and business and the corrupting influence of money on both. Needless to say, my blood was boiling after watching the film. You can imagine the effect, then, when I learned that on Wednesday, the House Financial Services Committee passed three bills that will cripple the Consumer Financial Protection Bureau, one of the most important innovations in the 2010 Dodd-Frank financial reform law that was a response to the conditions exposed in Inside Job. The Consumer Financial Protection Bureau has a simple and reasonable purpose: to shield consumers from unfair, misleading, and deceptive lending. 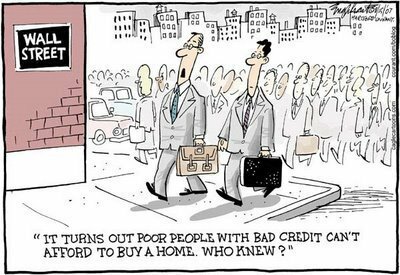 While we can rail on and on about people getting themselves into bigger loans than they could afford, a large share of the blame (if not the majority of it) belongs to lending companies that made loans they knew the borrowers couldn’t afford. If you’ve ever looked at the fine print of a lending contract, a credit card agreement, or any other consumer financial services legal document, you know that it is unclear and opaque even for the most educated of consumers. The purpose of the Republican bills is to deprive the Consumer Financial Protection Bureau of the power to fulfill its mission. Oh, and the fact that they stand to attract a lot of campaign money from financial firms by indicating their willingness to gut laws that protect consumers? Well, that’s probably a motivating factor, too. As much as I love the idea of free markets and unfettered capitalism, I think there is a place for regulation: when an industry’s actions causes harm to the larger society. Especially in regards to the financial industry, we’ve seen over the last thirty to forty years that as it becomes less regulated, it takes greater and more irresponsible risks. Ultimately, it is the taxpayers of this nation who end up bailing out the shareholders of these companies. I don’t know if this is an issue that bothers you. I try to keep this blog apolitical, but sometimes I think something of concern is worth sharing. If you’re so motivated, perhaps a quick email to your Representative and Senators to let them know your thoughts about gutting the Consumer Financial Protection Bureau would help ensure that the voice of the citizenry gets heard over the sound of all that money. This week, the House Financial Services Committee voted to approve three measures that would considerably weaken the Consumer Financial Protection Bureau. I want you to know that as your constituent, I would like you to VOTE NO on these measures, if and when they reach the floor of the House. It seems that our politicians have forgotten how we got into the financial mess of 2008. As much as I like free markets, the financial services industry is incapable of policing itself and needs stronger, not weaker, regulation. This is particularly true of consumer finance, where every effort is made by financial institutions to be as opaque as possible in an effort to entrap consumers in a web of bad decisions. Again, I’d like you to vote in favor of consumers rather than in favor of the financial industry and monied interests. VOTE NO on any reforms or weakening of the Consumer Financial Protection Bureau. This entry was posted in Uncategorized and tagged Beureau, Congress, Consumer, Finance, Financial, house, Inside, Intusry, job, politics, Protection, Reform, Regulation, Representatives, Senate by christao408. Bookmark the permalink. Great letter! I hope they’re paying attention! Great post Chris. I think I will send a letter to our representative too. I’m on this! Oh yeah. I’ll make sure my mother sees this post too – I only wish I could recommend it more than once! It won’t let me recommend! Grrrrr! i know i’ll totally get heat for this but only dumb a$$es think that unfettered capital markets are the key to solving everything. i have a post coming up on this and i’ll let you know when i put it up. great write up btw and i loved the letter. it’s awesome how involved you are in government being so far away! i sent emails to my reps..i still haven’t watched inside job. i heard all about it. knew about the info… just can’t “watch” it. I think i’ll be extremely angry/upset then sink into a black hole depression…. the situation is so helpless and we – i – feel so powerless…. @Sinful_Sundae – Honestly, I think that’s how the powers that be want us to feel. The more helpless we feel, the more we make no effort to speak up for ourselves. Regardless of our political differences, the bottom 95% of Americans are never going to be rich and the moneyed interests would like us to keep ourselves occupied with petty squabling so that we don’t wake up and notice that they are robbing us blind, getting rich on our savings accounts and retirement funds. @ThePrince – I’ve very eager to read your post. Sometimes I find being far away helps me be more involved because I get the filter of distance. Silly day-to-day stuff doesn’t make it to me because I’m outside the 24 hour media cycle. Bigger stuff does make its way to me, though, and I take notice. @murisopsis – Well, thanks for the virtual rec since Xanga won’t let you rec it in reality. I’m sure your mother will be banging the same drum. @ZSA_MD – Thanks for your support. Especially now that you’re a TV star in the tri-states area! =D@Ampbreia – Glad you like it. Spread the word, please. @christao408 – yes! i think your “filter of distance” description is apt. i’ve found that this was the case when i was away from nyc for an extended period of time. i was more involved with things in and about the city moreso than i was when i was actually there. i’ve found also that this filter of disstance also engenders a romanticism of the actual place…but then again, that’s me. You are a very eloquent man, my friend and your letter has its merits. But, they reality of these law makers is that they always have their best interest in mind. Big bank gives tons of money to them. Which they need to finance their re-election campaignes. So, I’m pressed hard to believe that anything will change. Though I applaud you for your will to take action. @christao408 – so true… yet so sad; let’s hope we’ll never become da nxt india… or china…. I’m borrowing this to send to my Rep here in Pennsylvania. RE: your letter, Why tamper with perfection? Lending companies had to diversify their risky assets/loans so that they could stay afloat. They were only looking out for themselves regardless of the damage it might do to our society. @ThePrince – Americans are so conditioned to believe that capitalism is going to save the day. They are also the same Americans who are fearfully anti-Communism but guess what, certain aspects of Communism are more effective than Capitalism. We’re just too afraid to admit because we don’t want to be labeled a socialist. Fascinating a somewhat poignant that such things occur and tarnish what would’ve been a properly working system. Canadian systems are more regulated, and I think that some regulation is definitely good. Too much freedom can be a bad thing, so just the right balance as you suggest seems to be prudent. I wonder if they’d listen to a random email from a Canadian? Probably not lol. that’s my point. he “seemed” liberal but not at all and that’s why republicans r willing to reelect him. but for da record, i do not support DADT or DoMA. never did. never will.